Successfully Added The Pegasus - Quadband Dual SIM Touchscreen Worldphone to your Shopping Cart. Introducing The Pegasus, a new 2.8 inch touch screen dual SIM unlocked cellphone that comes with vibration feedback on user inputs and has the latest technological touch screen interface design for the best end user experience. The Pegasus allows for simple drag and drop of menu icons from the menu panel onto the display screen for custom personalization. The Pegasus Cell Phone is a quad-band mobile phone supporting the four global standard GSM frequencies (850MHz, 900MHz, 1800MHz, 1900MHz) so you can be confident that it will work anywhere around the world. Coming with two SIM card slots with dual-standby function, you can be assured of never missing a business or personal call with two active phone numbers stored inside one individual mobile phone. This model cellphone comes fully unlocked, meaning you can you use it with the network of your choice. And if all that was not enough, The Pegasus comes with a 1GB micro SD card ready for you to store all your favorite music files and enjoy them on the go. The sheer beauty of this ultra slim mobile phone with its esthetically pleasant design, makes The Pegasus feel great and smooth in the palm of your hand. Built with motion control, and touch vibration feedback to user command inputs, along with a side gadgets bar, similar of that in Windows Vista, The Pegasus side gadgets bar can be viewed and hidden for best user viewing and accessibility. In addition, you can also drag and drop application icons from the side bar, and have 3 screen displays filled with your most used applications thanks to motion control allowing for quick slide from one display screen to another with just a swipe of your finger. Containing an impressive feature set, this mobilephone is the perfect mate to help make your daily life stress free and more entertained. 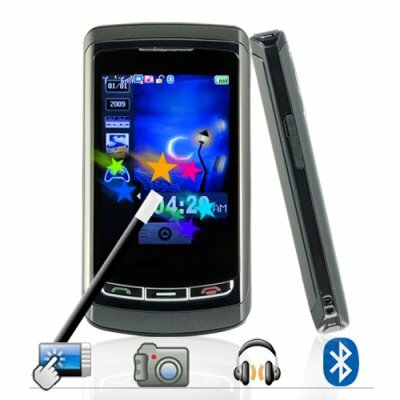 Global communication with text and picture messages (SMS and MMS), Bluetooth, two SIM cards, and a rich selection of PDA software tools make this phone perfect for the person on the go. Besides its primary functions of enhanced communication, you can also use the cellphones media feature set listen to FM radio, take photos with the on board camera, and play your music and video files. Are you in the market for a new phone for yourself or the one you love? Then this is the phone for you! The Pegasus is built to be the easiest to use phone you have owned. Made for today's busy life style, this mobile phone really will cater to your every need, whether you are a corporate exec or soccer mom. The Pegasus is in stock now for single piece or large bulk purchases. This gleaming hot new item makes a wonderful present for friends, family or that special someone. The CVDT-M55 is proudly brought to you from the leader in factory direct wholesale electronics, Chinavasion. heys guys just wanna say thank you for the items what fantastic items they are and how pleased i am that i have finaly found a good wholesaler with value for money. these phones are super easy to use ,smooth etc. and the service was prompt ,my order took one week for me to have my item in my hand here in Antigua i am extremely pleased with the service and will be placing another order within the next week! per il prezzo che costa va benissimo. arrivato 4 gg a torino. on 2009-12-02 05:13:27 Great phone at a great price!!!!!!!!!!!!!! I bought this phone for my daughter and she was delighted, its as good as many of the more expensive UK brands. Quick service and tracking was spot on, I was able to follow it the whole way and arrived exactly when stated. Thanks Chinavision will purchase aagain for sure! on 2009-12-02 04:50:23 Better than expected!!! Thank you for the fast delivery. The phone is better than described. Crystal clear and user friendly.